Ingushetia: Tips for travelers in the Caucasus "terra incognita"
The Galgai Country – that is what the Ingushetia residents call it. The Republic is the smallest and youngest within the Russian Federation having only achieved this status around twenty years ago. The republic sits quietly among its neighbours – North Ossetia, Chechnya and Georgia. It just so happened that a long period of economic and political instability, which Ingushetia was going through in the 90’s has preserved the beauty of this place in practically its original state. There are no fast food networks, shopping, entertainment centres, modern highways, or other signs of modern civilization. 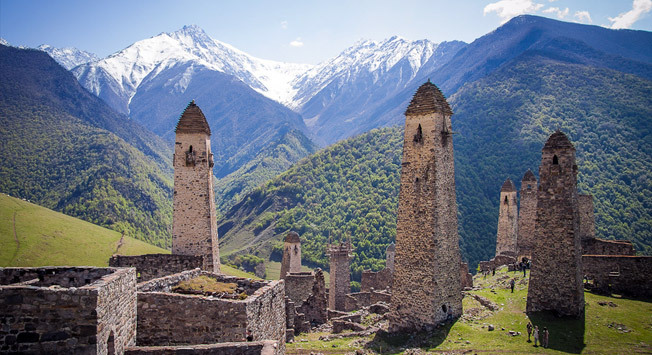 However there is something here very unique – one of the oldest Christian churches in Russia’s territory, and the main reason why tourists come here from all over the world – the ancient Galgai towers – silent witnesses to the complicated history of North Caucasus. In the place where Magas is situated now, once there lay the ancient capital, Alanya. It was a state occupying most of the North Caucasus. The city has been the capital since only recently, from the year 2000, and like all young cities it is still in the process of creating its appearance. This is a city and a building in one, clean, cozy with wide avenues, and completely safe. There are no “old neighborhoods" or "Caucasian ethnic flavours", modern buildings, streets or open-air cafes. Ingushetia is a region in Russia where Islam is practiced and repected much like any other religious practice. You are unlikely to be able to purchase alcohol at local stores but always have the chance to purchase beer, wine or hard liquor if they are prepared to make the hour long journey from Magas, Nazran or Vladikavkaz - the capital of neighboring North Ossetia, where regulations are not as strict. So we eat our food, the typical local cuisine of boiled beef with dumplings and garlic broth, lamb, fresh herbs, fresh vegetables and delicious cakes with cream cheese - "Chapilgash", and wash it down with mineral water called "Achaluki". In Ingushetia, they are very proud of the water extracted from the sources in the Dzheirakh area. Experts say that the Ingush water is similar in its composition to the water from the source of the famous French Vishy-Grande-grille and the Silesian source in Germany. However, people do not come to Ingushetia just for drinks. The republic’s main tourist attraction is its old ancestral towers. Today there are about two thousand of them. The most famous ones are – Vovnushki, Egikap, Laimy, Ozdik and Hamhi. Russian and foreign tourists rush to Ingushetia to see these mountains, scattered over all the mountainous regions, and of course the magnificent Caucasian mountains. The most famous battle castle is the tower complex "Vovnushki", which is a finalist in the All-Russian contest “The Seven Wonders of Russia". Anyone who has once seen it together with the other monuments of the ancient Galgai people will forever remember their silent beauty. For hundreds of years the towers defended the residents from sudden raids. Until relatively recently, people were living in them, but the Stalinist deportations in 1944 are responsible for there being almost no one here now. The NKVD troops attempted to blow up the ancient buildings of the Galgai people, but the order was not executed – the Ingush people who had remained in the mountains, resisted as they could. Due to their struggle, we can still see the amazing monuments of many nameless heroes, unlike anywhere in the world. Not far from the "Vovnushki" is one of the oldest Christian churches in Russia’s territory of the VIII – IX centuries – Thaba Yerdy. However, the Dzheyrahsky area is worth visiting not just for the sake of seeing the ancient sites. This winter in Ingushetia, the first ski resort is operating in full force in the Armkhi area. Of course, Armkhi is not Courchevel yet, and Ingushetia is not France, but the process has begun. Gradually, a small Galgai country has become the centre of the tourist attraction. The New (Ingushetia) road is an earth road. The Old (Ossetian one) is asphalt. Both are of good quality, the border guards keep them in order. Following the asphalt road from Vladikavkaz, you can quickly get to the western part of the Ingushetia Mountain, Dzheirakh villages, Armkhi and further, to the Lower Hiuli. From there, the earth road leads to the main attractions – the villages Egikal, Targa Vovnushki, Tkhaba-Yerdy. It binds to the lowland mountain Ingushetia with the plains of Nazran and Magas, so that it is quicker to get to the sights of the eastern part of the Jeirakh district from the Ingush side. In the spring, the road to Vovnushki may be impassable for vehicles due to river flooding. One would have to travel by foot the last couple of miles, and the final part is made up of narrow stones along the edge of the riverbank. Proceed with caution. The border zone with Chechnya and Georgia passes through Ingushetia’s mountainous area, so foreign citizens must obtain special permits which should be issued in advance by the republic’s Tourism Commission, as travelling to Ingushetia should be planned in advance. However, there is a possibility that permits for visiting the Mountain Ingushetia for foreigners will soon be cancelled, which will undoubtedly affect the number of tourists coming into the country.